Well, I’m sorry to say that after two and a half days of really brutal hiking, we have quit the trail. Progress was simply too difficult, too slow and too strenuous. Hiking through deep snow was exhausting, and if anything had gone wrong I doubted that we would have had the reserves of energy or warmth to get ourselves out of trouble. And I wasn’t convinced that I was enjoying it on any level. Neil was enjoying it in his own way, but as anyone who has been caving with him will testify, he loves a bit of misery! Things started out well enough with a quick succession of three lifts taking us up to Mallaig. 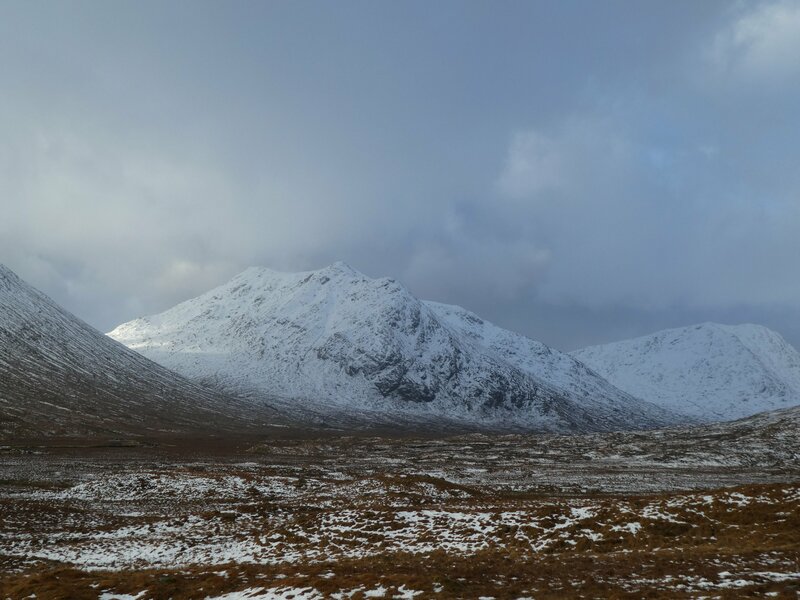 The scenery was absolutely stunning, with Rannoch Moor and Glencoe covered in snow, and tier upon tier of gloomy crags looming over us as we spend down the glen towards Fort William. Two more rides took us along the lovely Glenfinnan; by now the sun was shining on the snowy tops, which looked pristinely white against the bright blue sky. 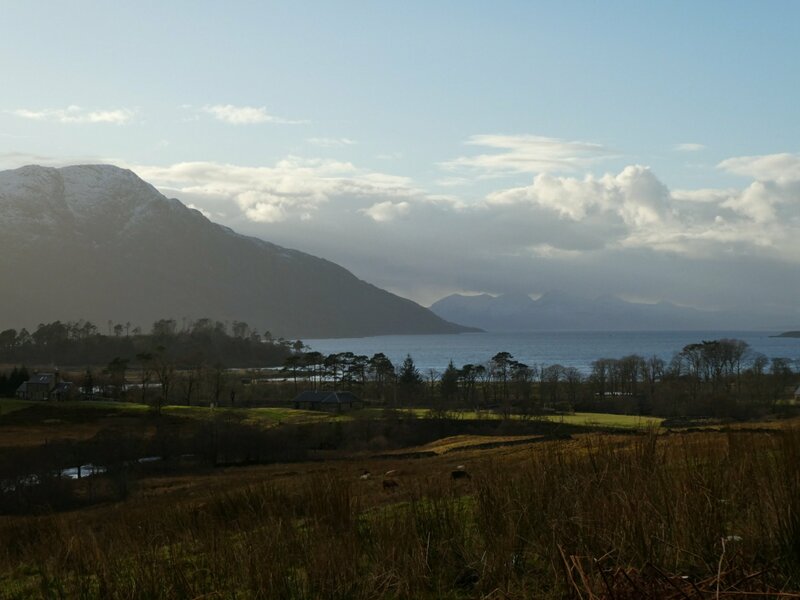 As we reached Mallaig, we could see snow on the mountains of Skye and Rhum over in the distance. After a good hot lunch in the Seamen’s Mission Cafe, we caught the tiny ferry across Loch Nevis to Inverie on the Knoydart peninsula. Of the dozen or so people on the ferry, we were the only ones who weren’t locals. 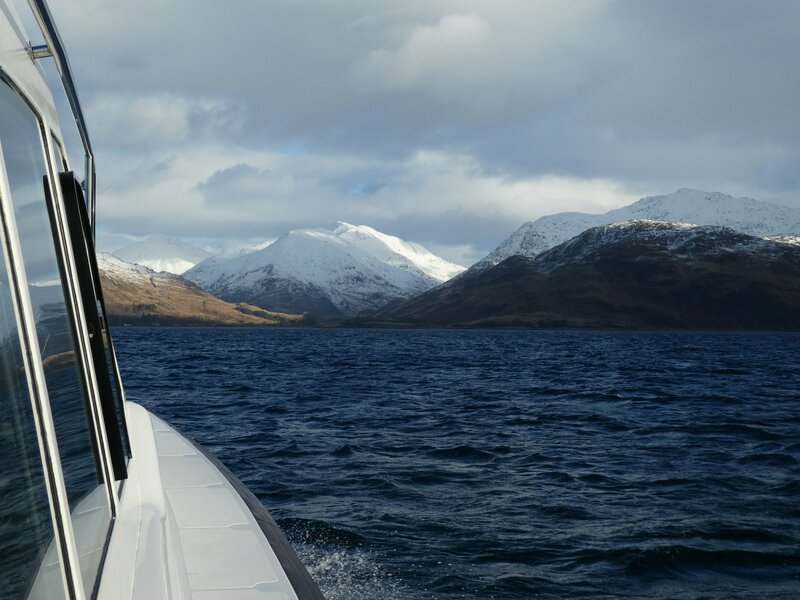 Everyone else was chatting away, catching up on news as I snapped away at the beautiful views of snowy mountains surrounding the loch. It was 3pm by the time we arrived at the small jetty at Inverie. We wanted to get to Sourlies bothy that night, about 9 miles away, so we set off at a fast pace along the shore then up Glen Meadall. The sunshine soon faded, and within about a mile we were walking through a mixture of snow, slush and bog. As we climbed higher, the snow got deeper and deeper – soft, unconsolidated snow, with deep drifts waiting to swallow us up. Progress slowed, and the light started to fade. I had hoped we would get to the top of the pass in daylight, but we were still floundering in the snow a good half mile from the top when we gave in and got our headtorches out. When we finally reached the top sometime after 6pm, it was starting to snow, so we quickly hurried down the other side, zigzagging down a steep snowy valley. 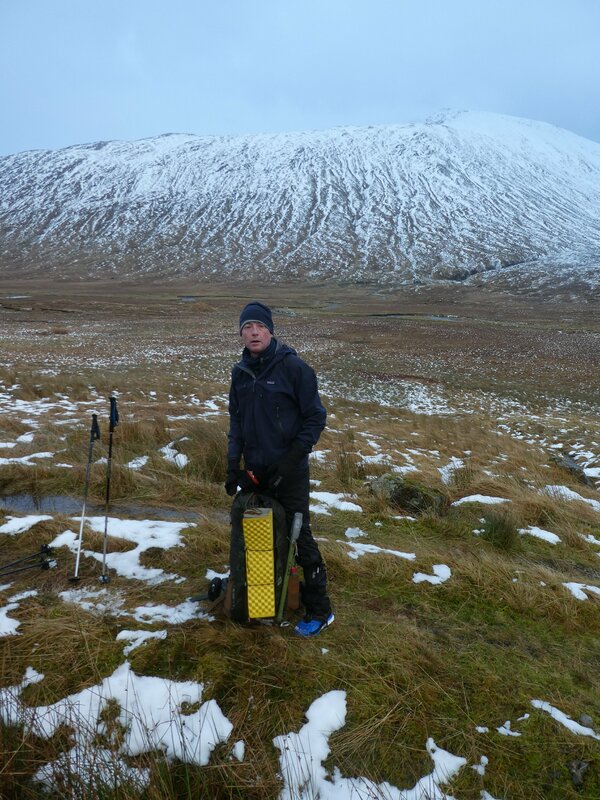 We were looking forward to getting down off the snow, but when we did the path was awash with meltwater and slush. 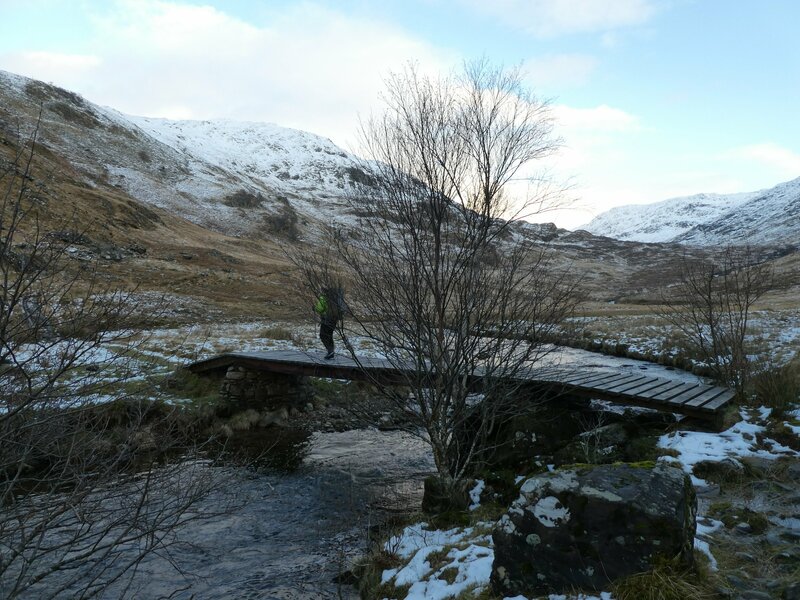 Our feet were soaking wet by now in any case, so by the time we got to the site of the washed-away bridge at Carnoch, we had no hesitation about just wading through the river. Now that we were down at sea level, the temperature was noticeably colder than it had been higher up. A few stars were peeking out from behind the clouds, and there were occasional patches of ice amongst the marsh reeds as we waded our way towards the seaweed-strewn shore. 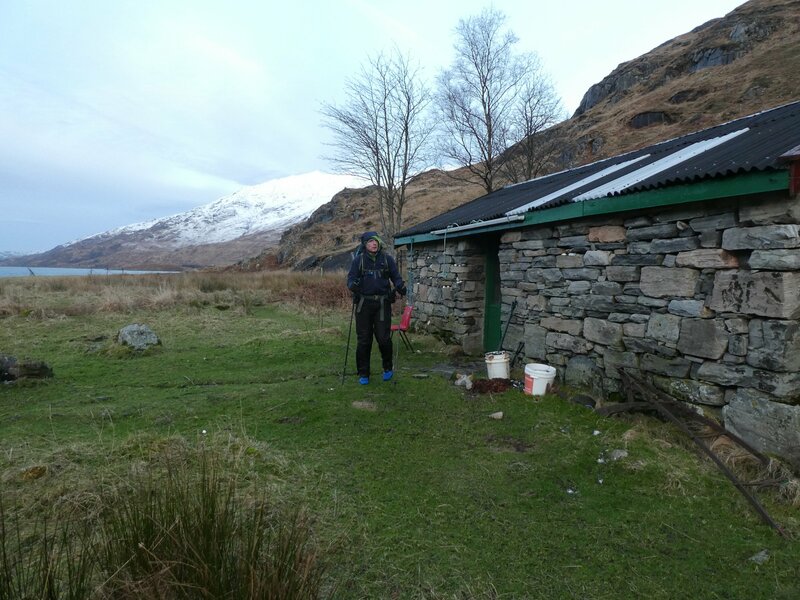 After what seemed like miles of walking across slithery seaweed and salt marsh, we were hugely relieved to reach Sourlies bothy at about 8.30. Like most bothies, it is an old stone building with a fireplace, a table, a couple of chairs and a sleeping platform. A small shadow scuttled off into a corner as we arrived; previous occupants had left some food, providing a feast for a hungry mouse. We quickly got changed out of our wet things, made soup and pasta, then climbed gratefully into our sleeping bags. The next morning came all too soon, and it was time to abandon the glorious warmth of our sleeping bags and put our damp clothes on again. 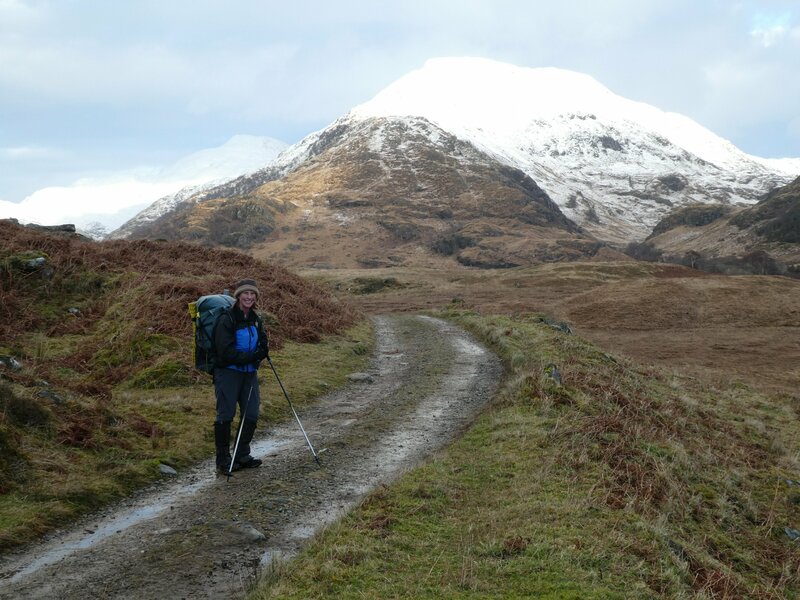 After a quick breakfast of flapjack and coffee, we set off along the shore and up the glen to Mam na Cloich Airde. 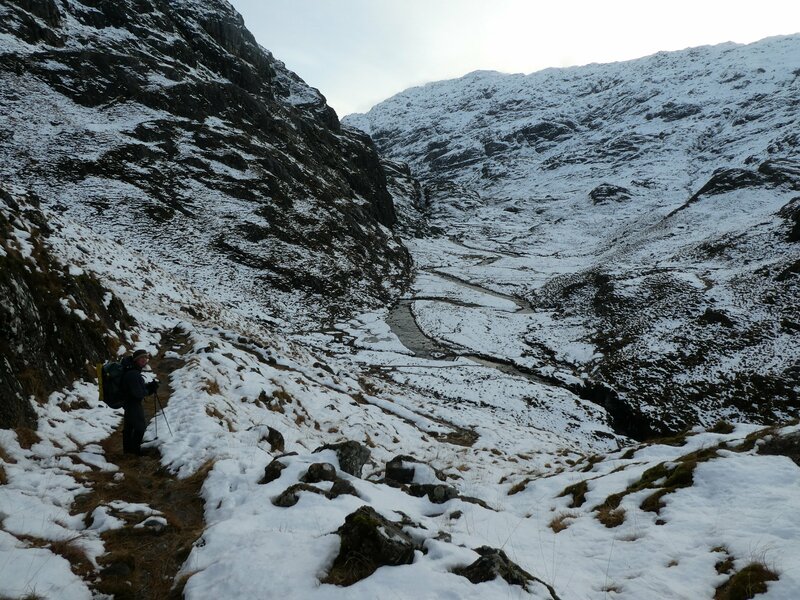 A reasonable track led steeply up through small crags, bogs and streams, before disappearing under snow. 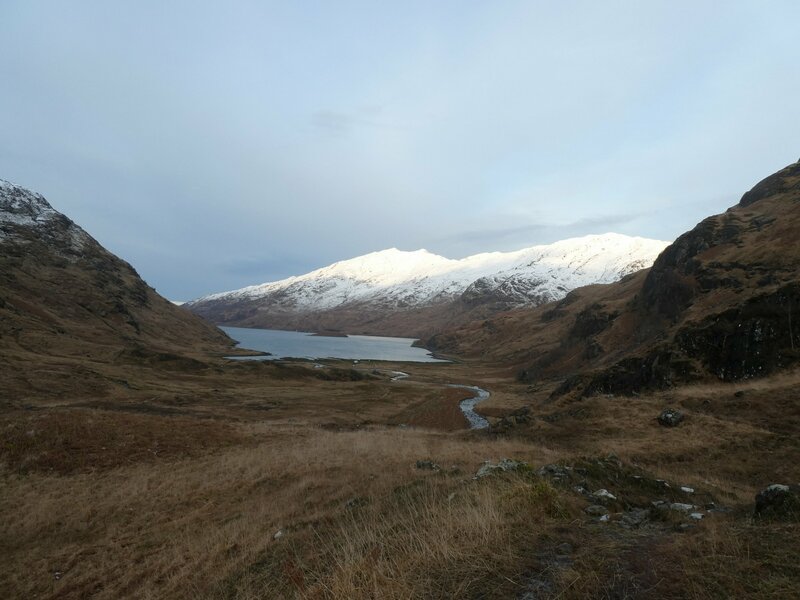 We followed its route as best we could, past frozen lochans and crags, until it dropped downhill, past forestry plantations and down to a track along Glendessary. 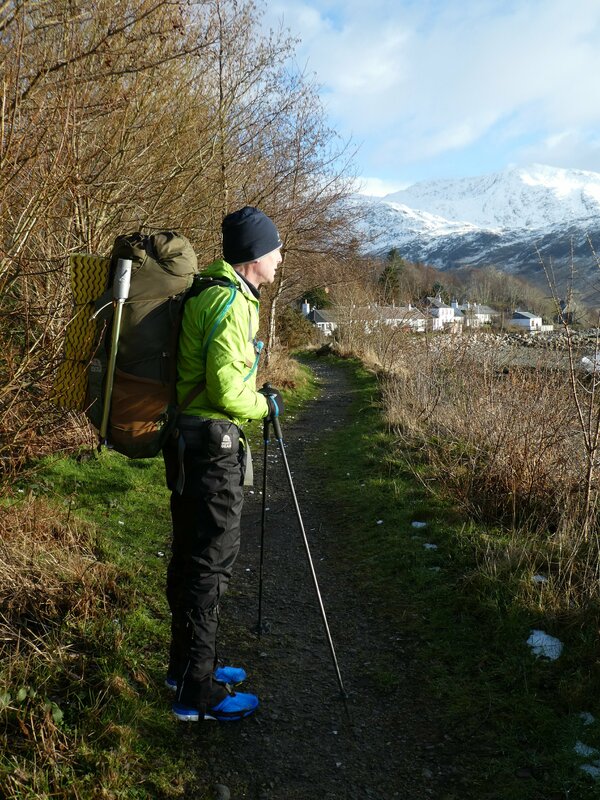 This should have been easy going, but was covered in ice and snow – there were to be no easy miles for us! We planned to have a short rest before tackling our second pass of the day, but with cold wind and sleety snow we decided to keep going. We turned sharply uphill and began the steep climb alongside Dearg Allt. Although this pass was only 455m above sea-level, it proved to be the most testing yet. There was no trail to follow, just a lot of cross-country over bogs and streams. Countless times we fell through thick snow drifts, our feet punching through the snow into icy water underneath. We stumbled into deep drifts, with our packs falling sideways and making it hard to get up again. Neil checked his GPS at one point and told me we only had 40m more ascent to go; but it was a good half a mile in distance and seemed to take forever. Neil was breaking trail, I was struggling to keep up following in his footsteps. My back was hurting from stumbling in the snow, I was exhausted and I felt sick. And with that, it was agreed. Our progress was too slow, and it really wasn’t much fun. 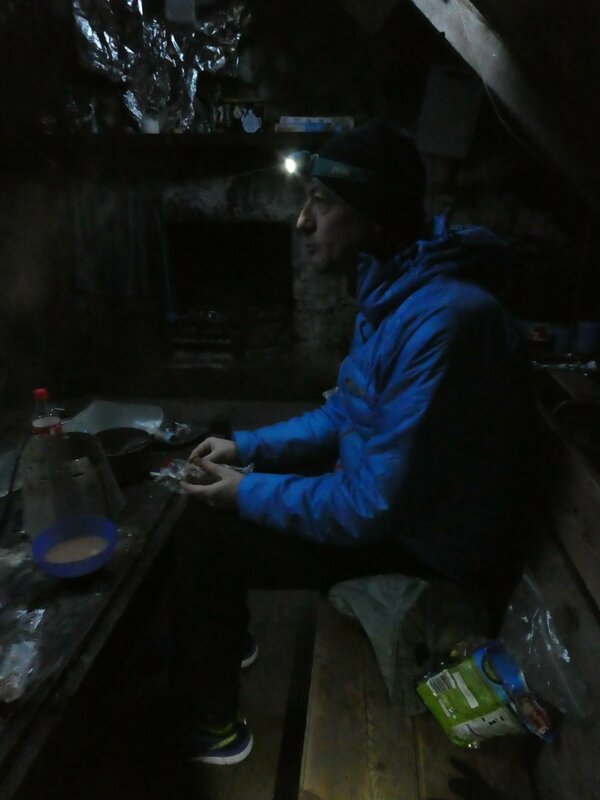 We reached Kinbreack bothy about 4pm in heavy drizzle, and thankfully closed the door behind us. Downstairs was a workshop, with a floor of earth and cobbles; our accommodation was upstairs, a nice room with a fireplace and benches. As we lay down to sleep, bellies full of Cup-a-soup and instant potatoes, the wind howled around the old building and the rain beat down on the perspex skylights. 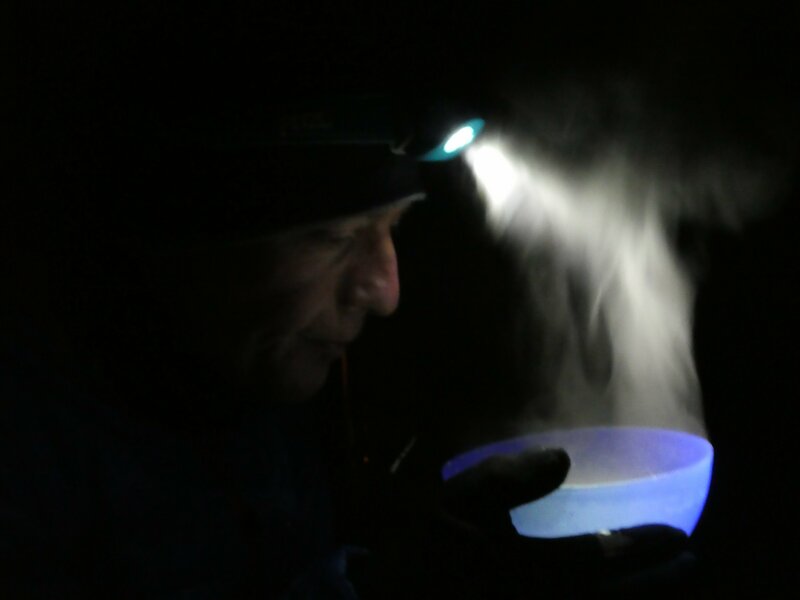 Our feet were numb, and the floor was hard, but we were tired, and by the time daylight started filtering through the skylights the next morning we were snug, rested and reluctant to move. But if we were going to quit, we had a long walk out ahead of us. 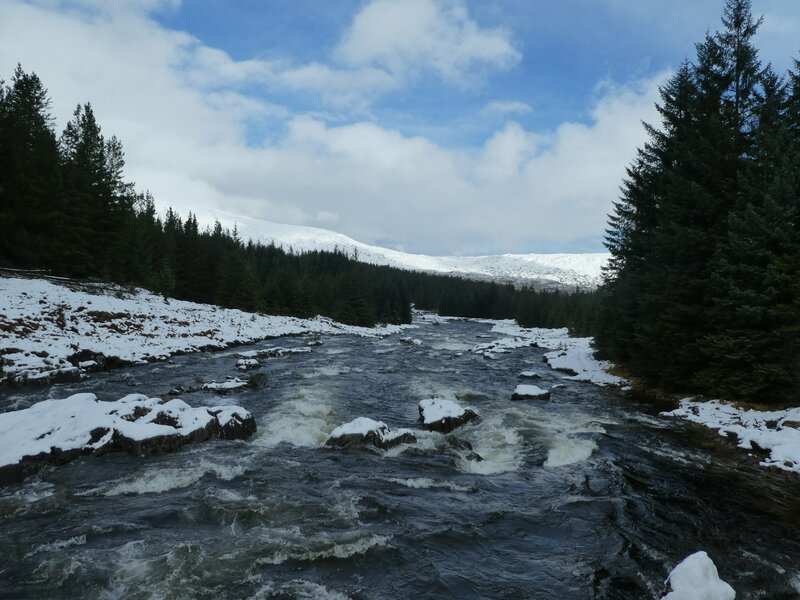 First up – a rough tussocky walk down to the River Kingie, then we had to cross the river. There was no bridge. The river was a good 8 metres wide, and after a full night of heavy rain it was fast flowing and deep. We’ve heard too many stories of walkers getting washed away on river crossings. With no desire to add to the sad statistics, we headed upriver looking for a good place to cross. 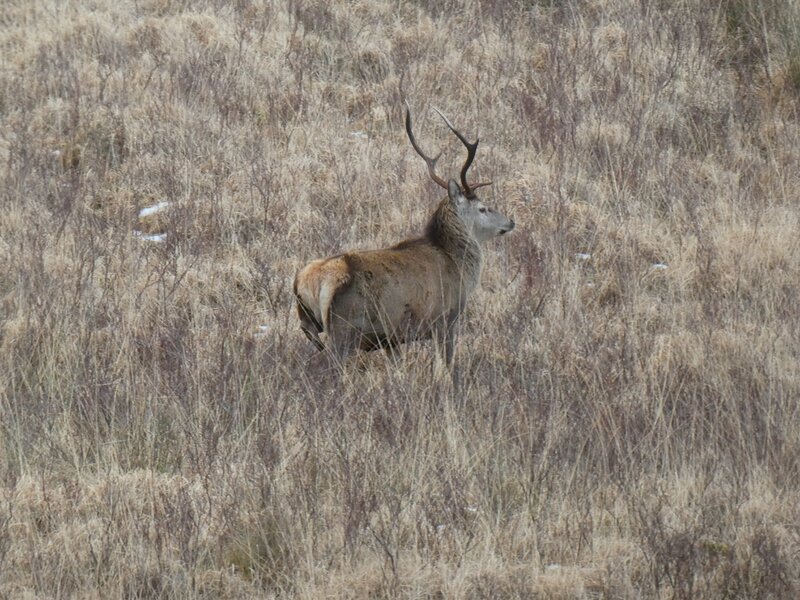 Finally we thought we’d found one – a relatively straight section, no undercut banks, no riffles or eddies. We entered the water at the same time, with me a short way upstream. Neil got through with water only up to his knees – I was less lucky with freezing cold water up to my crotch! Still, we both got through ok, and once we got out the other side we headed up to the track which would take us all the way along Glen Kingie to Glen Garry, civilisation and a lift to Fort William. 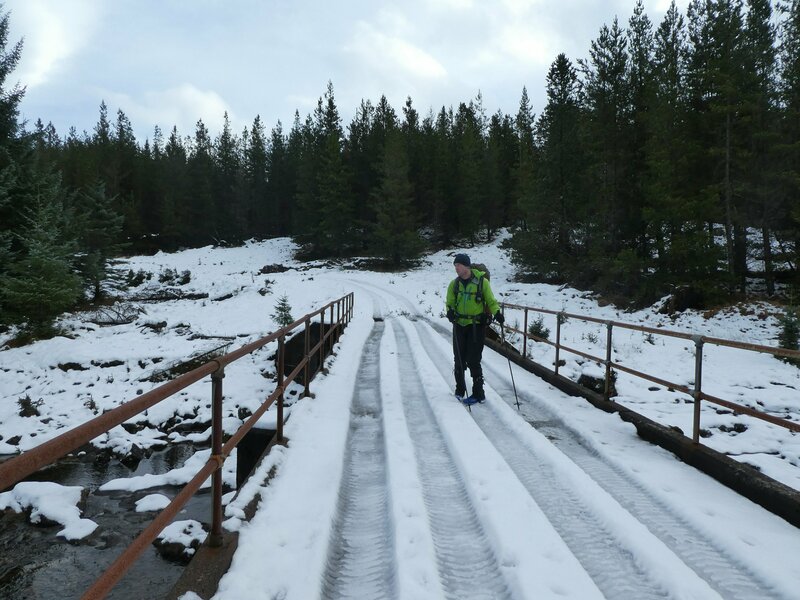 Of course it wasn’t that straightforward – for mile after mile the track had three options for walking – snow, ice or meltwater. My feet had gone numb when I crossed the river, and it would be a good 3 hours before I got any feeling back. Eventually the track gave way to tarmac, and with a few houses dotted around, and a salmon farm, we thought we might get a lift. But as we trudged along the road in pouring rain, none of the half-dozen or so cars that went past even bothered to slow down as we stuck our thumbs out and looked pleadingly at them. By the time we got to the main road, it was 4pm, the light was starting to fade, and for twenty minutes we became increasingly worried that we weren’t going to get a lift before dark. But it only takes one kind person … Or in this case, two, two climbers on their way back to Fort William from a weekend’s climbing on Skye. We squeezed into the back of their small car with our rucksacks on our laps, and we were on our way. 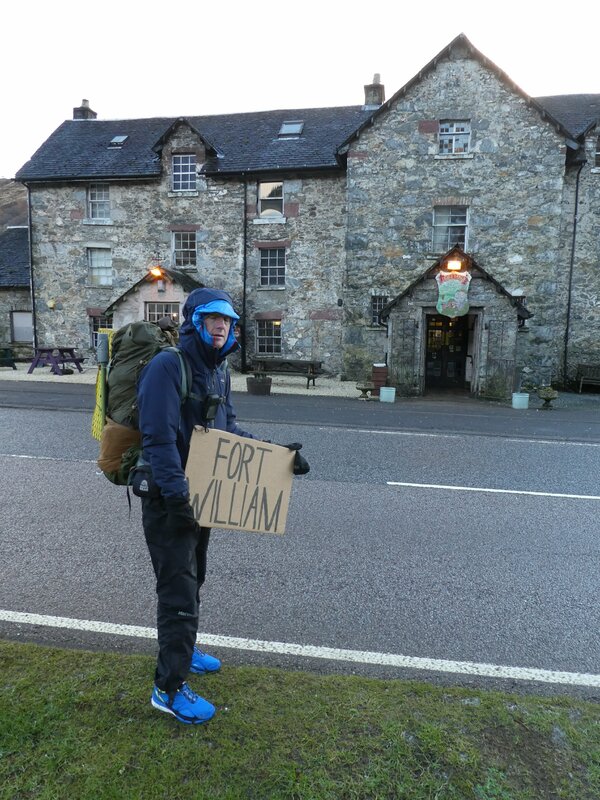 Hot showers, hot food, beer and a warm comfortable bed in Fort William. Bliss! Obviously we have been mulling over why we didn’t succeed on this hike, and what we should have done differently. 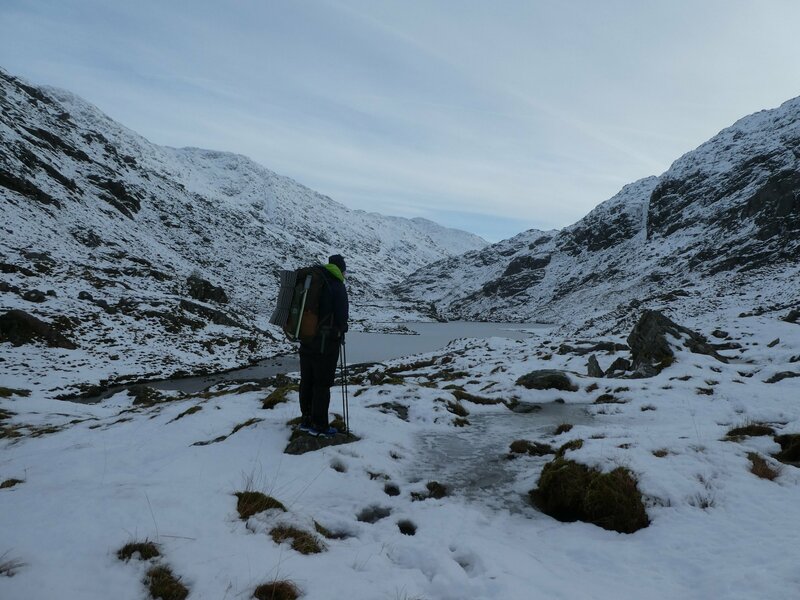 I’m sure that anyone with experience of multi-day hikes in winter conditions will have suggestions – snowshoes being one of the first things to come to mind. But reflections can wait for another day and another blog post. Right now I’m just glad to be home! Well done persevering for 3 days. Good weather walk me thinks! No need to feel ashamed of pulling off the trail. From your report you carried on for 3 days, were many would have thrown in the towel before even boarding the ferry from Mallaig. Both of you will have learnt from this hike and Don’t forget both of you set off coming out of some sort of virus. 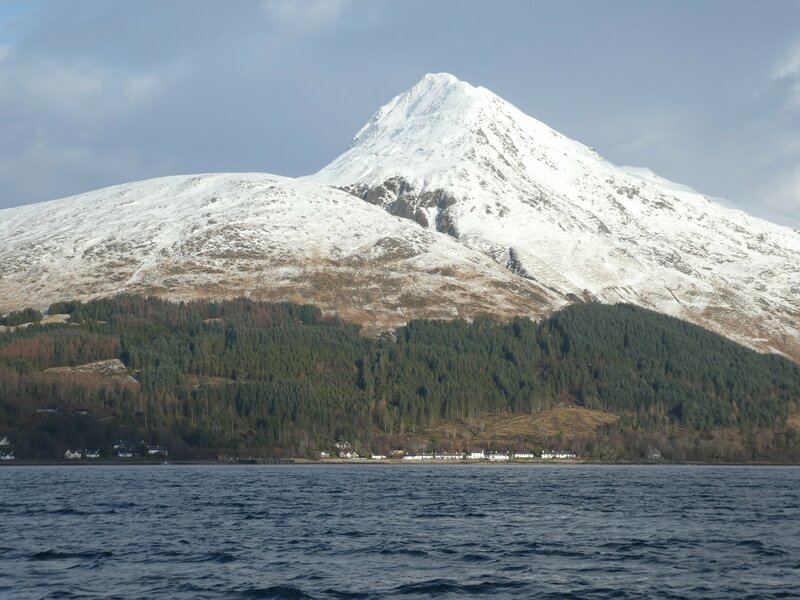 Hold your heads up high and celebrate a winter hike in Scotland. Wet is bearable, so is cold; but when both get together, wise is better than bold. (I made that up for you – wet and cold are a dangerous combination). We enjoyed your well written experience. So relieved to know that you were wise enough to choose safety. It looks beautiful but sounds horrendous!